Ji-li only does limited school visits currently. 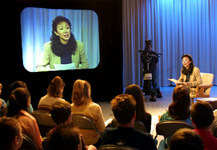 However, her presentation on DVD is available, and she is happy to talk to students on Skype. Since the publication of "Red Scarf Girl" in 1997, Ji-li has been invited to hundreds of schools and conferences. Her presentations have been described as “powerful”, “inspiring”, and “informative”. Many schools invite her back every year, including some for over ten years. Please click on General Information for details.